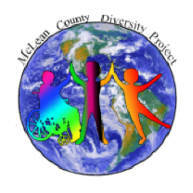 The McLean County Diversity Project was started in 2002 by Jeffrey A. Schwartz, then the Mayor of the Village of Downs, Illinois, as a way to educate residents on the value of diversity within a community. The Project focuses on educating youth, since studies show teens are still learning and forming opinions about differences and acceptance. The mission of the Project is to foster a functional and rational acceptance of the differences that reside in us all. Our goal is to accomplish this by providing unique opportunities that would otherwise be unavailable to our Scholars. This mission and goal were accomplished the first year, when the Project partnered with the Boys and Girls Club in Bloomington, Illinois to take a diverse group of students from Downs and Bloomington to Gettysburg, PA. Students learned about and discussed the emotional and physical events that took place during the Civil War and its era. Since that time, the Project has partnered with other cultural entities and is now open to all students in McLean County. The Project has also evolved into a year-round opportunity for students. Learn more. If you'd like to support the mission of the McLean County Diversity Project, click the Donate button below. If you prefer to make a donation in another manner, click here for information. McLean County Diversity Project scholar Revanth Poondru started the Blo-No Book Drive in 2018 to collect money to purchase books for students at underserved schools in Bloomington-Normal. Illinois Prairie Community Foundation, as fiscal sponsor of the McLean County Diversity Project, is overseeing the collection of monetary donations to the book drive. If you believe that books open the door to the world, please consider donating to the Blo-No Book Drive to provide books for underserved schools in Bloomington-Normal. Donation of books (new or used) are NOT being collected. View flyer on Blo-No Book Drive.